Today marks entry number two of A Dive Masters Diary so I thought I’d give you a little insight into a day in the life of a DM at Roctopus. A standard day for us includes a couple of dives in the morning or in the afternoon and the remainder of the day spent at our dive shop down on Sairee Beach in the Wind Beach resort on Koh Tao. Diving in the morning, we get down to the shop at 5:45am to organise all the equipment that we and our fellow divers need. This includes BCD’s, wetsuits, fins, masks and regulators. Once everyone has arrived and all of the necessary equipment has been packed, we jump on a taxi and head off to the pier. After everyone and everything is on the boat, we head out to our first dive site. Chumphon Pinnacle or Southwest Pinnacle are our favourite sites for the morning. 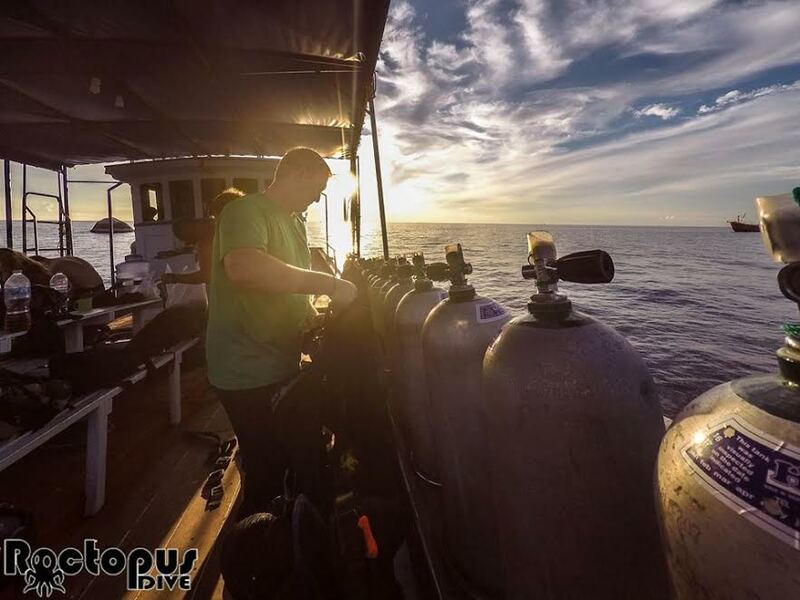 Large dive sites with depths down to 30 metres, we love taking our fun divers here because deeper is always better 😉 The first dive usually goes for around 35-40 minutes (the deeper you go, the less time you have under the water). Once we surface, we jump back on the boat for our surface interval where we sit and chat about our dive, what we saw and offer feedback to any divers that might just be starting out and are looking to improve their skills. We head over to our second dive site now that can change depending on what courses we have on the boat that day and what the weather conditions are like. We could head to the wreck, or perhaps Greenrock or Whiterock, a couple of sites that surround Koh Nangyuan island. Most of you that are reading this would have seen pictures of Koh Nangyuan and know how beautiful it is there. 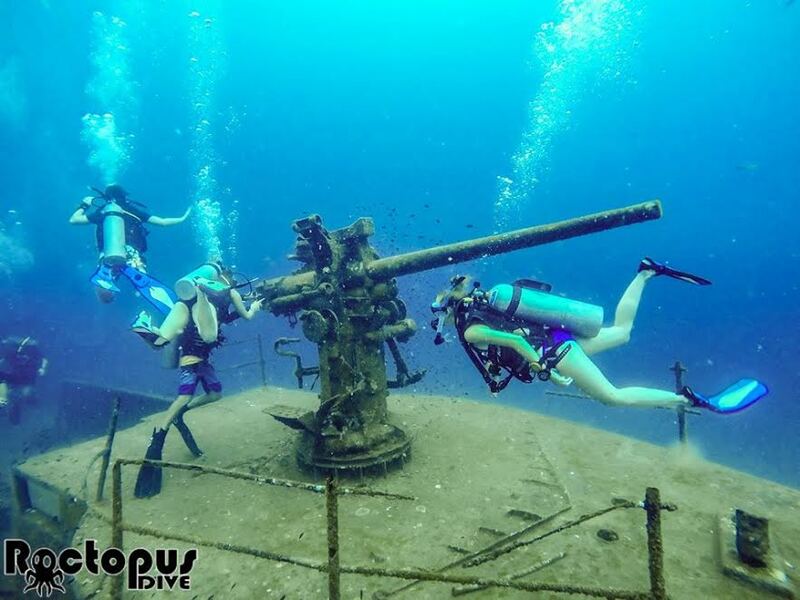 The dive sites are no different. The wreck, sitting in between 20 and 30 metres, is an unbelievable site when it comes into view. With two huge cannons, one at the bow (front of the boat) and one on the stern (back of the boat), it is easy to get distracted by its dominance in the water. Different to Greenrock and Whiterock, which both have a huge collection of different hard and soft corals and bright colourful fish, the wreck is an awesome dive to complete if you haven’t seen many wrecks before. Our second dive, shallower than our first dive, tends to go for a little bit longer – around 45 minutes. After surfacing from this dive we head back to the boat and then get on our way back towards the pier. After a quick debrief of the morning with all of our divers, we jump back up onto the pier and onto the taxis, back to the shop for a quick gear clean. Once everything is cleaned and packed away, any dive masters or instructors that are going out in the afternoon can begin to pack and organise the afternoons dives. We fill out our logbooks with our divers and talk to them about where they should be going to relax on the island for the rest of the day and where they should go that evening to come and have a cheeky beer or two with us that evening. Once our morning divers have finished asking us 1000 questions about the island, it’s time to get back to work. 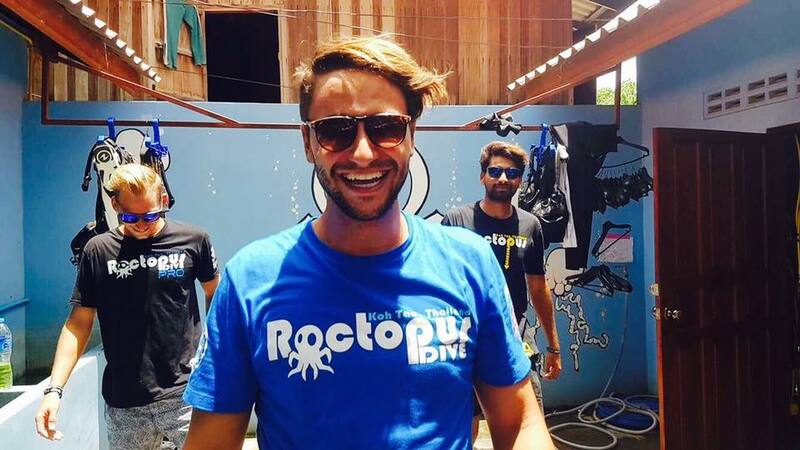 The back office is Roctopus’ Dive Master headquarters. There are 4 DM’s at the moment and there is usually two of us in the office at a time while the other two are out diving. 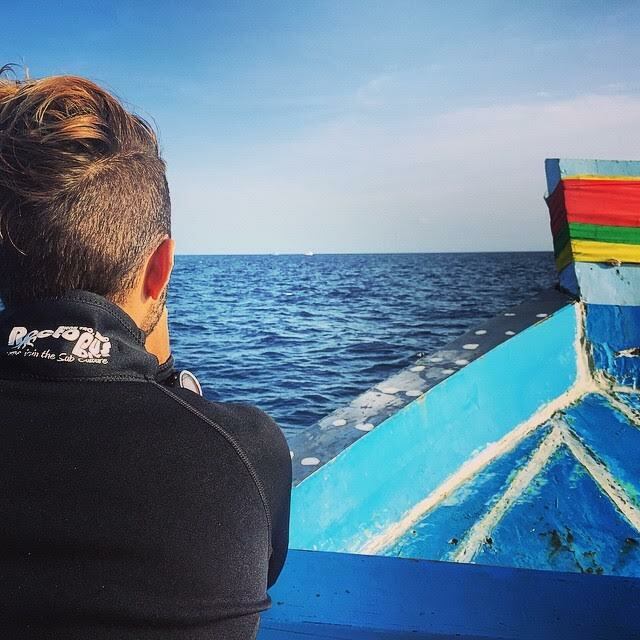 We organise the boats for the following day, ordering tanks and making sure that we have everything we need on the boat – from first aid equipment and oxygen, to coffee, tea, biscuits and water. Everything that goes on the boat, goes through us first. Any instructors that need equipment such as computers or compasses, come to us to sign their equipment in and out. We check for faults in equipment and make sure that anything broken is fixed as soon as possible. We also help with scheduling different courses onto different boats so that our operation runs as smooth as possible. Amidst all of this diving and organising, we spend time outside making sure the shop is clean and tidy. Half the time is spent laughing and chatting to backpackers walking past. Although we are a Dive School, we can offer advice to anyone visiting the island on what they should be doing to enjoy their stay here the most. 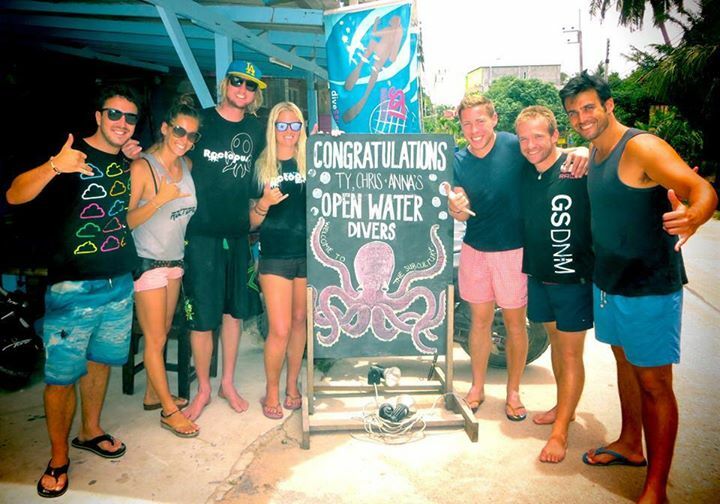 Our day finishes with a few final checks and then we all head down to either Victors bar or Choppers bar to watch a video of the open water students that completed their last dives that morning and are now certified divers, ready to go diving anywhere in the world. 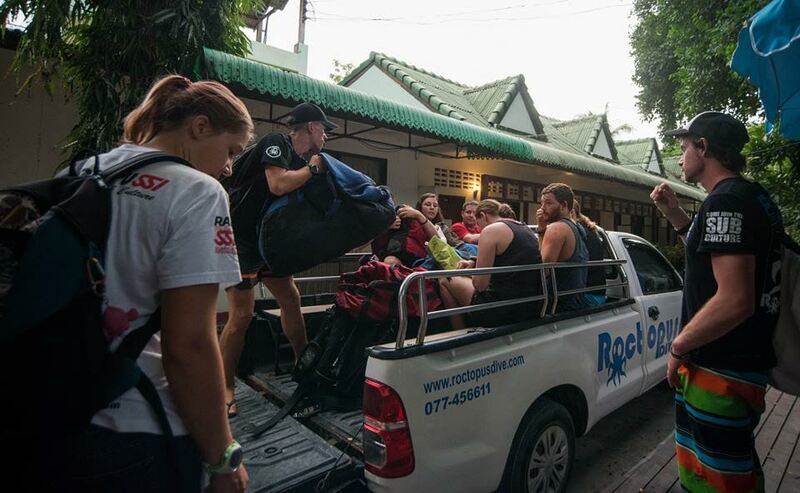 After a few cheeky beverages, hanging out with our divers from that morning, we head home. We start again at 5:45 tomorrow morning so you know, beauty sleep is needed too amongst all the fun. If you have any questions or queries or you just want to know a bit more about the island, send us a message on Facebook or an email. We’d be happy to help! Thanks for reading my second post, I look forward to next weeks edition where I’ll talk about a few different bars on the island!